We risked our lives through the sea, all this in the name of a better life for my children,” says Asad Bairam, a refugee from Syria. His voice is just one of the thousands of refugees who have similar stories, who have found themselves in Greece. 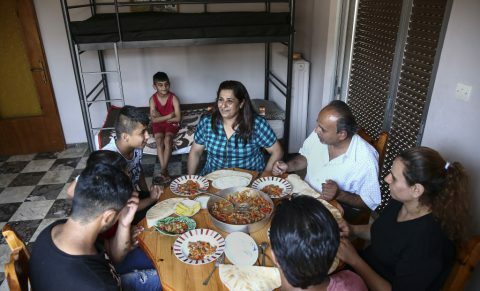 This includes the launch of the flagship ‘Emergency Support To Integration & Accommodation’ (ESTIA) programme to help refugees and their families rent urban accommodation and provide them with cash assistance. This marks a change from previous humanitarian projects which mainly provided support for accommodation in camps and the provision of direct supplies. The ESTIA contracts were announced by the Commission and the UN Refugee Agency (UNHCR). Today’s funding comes on top of the €192 million contracted through the EU’s Emergency Support Instrument in 2016 and therefore more than doubles emergency support to Greece to a total of €401 million. Overall, the European Union has mobilised over €1.3 billion of support (until 2020) to Greece to help manage migration and the external borders, through various kinds of funding. A €93.5 million project with UNHCR, under the ESTIA programme, sets up large scale rental project to improve living conditions of refugees by providing 22 000 urban accommodation places. It will increase the number of refugees living in rented apartments in Greece up to 30 000 by the end of 2017. Some 2 000 rented accommodation places will be located on the Greek islands, with the bulk of apartments rented in cities and towns on mainland Greece and local landowners receiving a stable and reliable income for these apartments. A number of municipalities in Greece are also formally part of this project. A further €57.6 million project with UNHCR, under the ESTIA programme, will set up a basic social safety net for all asylum seekers and refugees in Greece by providing them with pre-defined monthly cash allocations through a dedicated card. It aims to enable refugees to meet their basic needs in a dignified manner. The allocations are consistent across the country, and pegged to the Greek emergency social safety net, as well as being based on the refugees’ family size. Using this card, refugees can fulfil their basic needs such as food, medicine and public transportation. At the same time, this assistance is re-injected into the local economy, family shops and service providers. The remaining funding will go to humanitarian NGOs to top up existing projects addressing pressing humanitarian needs in Greece, including shelter, primary health care, psycho-social support, improved hygiene conditions as well as informal education. A full list of the funding and projects can be found here.